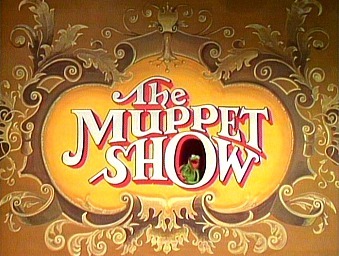 The video clip features the opening titles and theme music from The Muppet Show which first aired in September 1976 on CBS in America, and in the UK was shown on ITV. 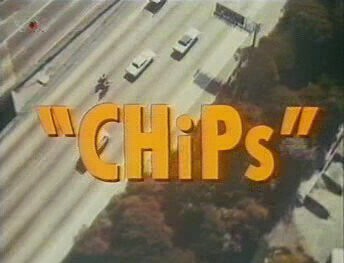 The show was produced at the ATV studios in Herts, England and ran for five seasons (120 episodes) with two pilot episodes. In ode to the chaotic nature of the show, I haven't listed the main characters below in any particular order. 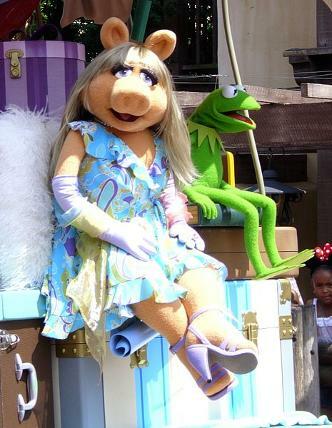 The show's main muppet was, of course, Kermit The Frog who was the manager of the cabaret-style theatre, and created by Jim Henson, the puppeteer who also created The Muppet Show. The long-suffering frog had to deal with some very strange characters on and off the stage. The domineering Miss Piggy (played by Frank Oz) was not one of the main characters until well into the series. She was obsessed with becoming a star, but had unpredictable mood swings and would often fly into a rage, karate-chopping poor kermit in the process! 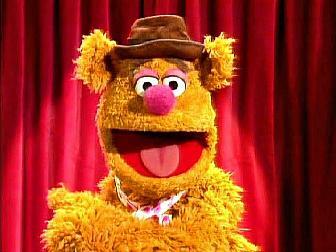 Fozzie Bear (Voiced by Greg Berg and puppeteered by Frank Oz) was an orange-coloured comedian bear who was terrible at telling jokes. He would always wear a spotty neckerchief and pork pie hat, and was often heckled by the two spiteful old men Statler and Waldorf. He was a big character earlier on in the series, but had less airtime as Miss Piggy became more popular. 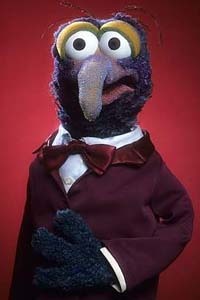 Gonzo The Great was, perhaps, the ugliest muppet and was a stuntman who didn't like to conform to any rules. He had a pretty weird appearance to say the least, with a long bent nose, huge boggle-eyes purple fur. He was in love with Camilla The Chicken and always played the final trumpet note at the end of the opening titles, with unpredictable results! 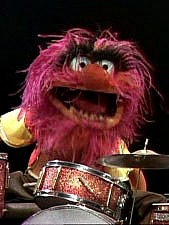 One of my favorite characters, Animal, lived up to his name and was a crazy drummer in the band Dr. Teeth and the Electric Mayhem. He was operated by Frank Oz and his only form of communication was shouting and grunting. He had an outrageous, almost violent drumming style, and it is believed by some that he was based on The Who's drummer Keith Moon. 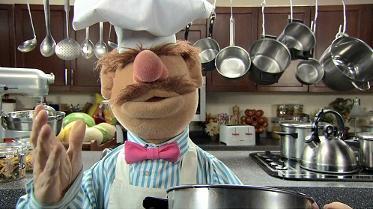 Based on TV chefs of the time, the Swedish Chef was a stereotypical swede who would talk gobbledygook (muttering odd words in English) and would always start singing while waving or throwing his utensils around. He had no regard for health and safety rules and created his meals using utensils not normally found in a kitchen such as work tools and firearms. 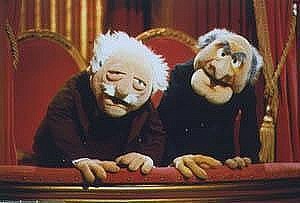 Statler and Waldorf were two cantankerous, but witty old men who sat in the balcony heckling the acts, especially Fozzy Bear who they would sometimes throw tomatoes at. These two were always laughing at their own humour, and even though they were always criticising the acts on the show, they always returned the next week. 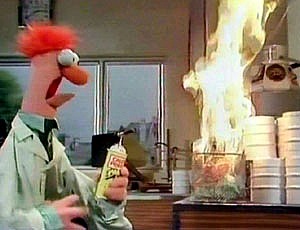 Beaker had to be the funniest muppet, and I adore his funny-looking face which looks permanently startled with shocking red hair, bulbous eyes and a wide-open mouth. 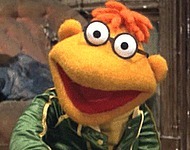 He was Dr. Bunsen Honeydew's assistant, but didn't appear until season two. He was always suffering from bad luck and seriously injured himself in each episode. His only form of communication was a nervous "meep" noise which he repeated over and over. A great character! 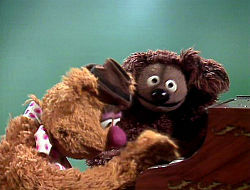 Rowlf the dog was the pianist who was very quiet and laid back. He never really noticed the havoc being caused around him. Rowlf was actually known long before The Muppet Show and made a regular appearance on The Jimmy Dean Show between 1963 and 1966. Scooter had a gopher-like appearance and, bizarrely, his eyes were actually the lenses of his specs. He was the shows backstage errand boy (or Gofer, which may explain why he looked like a gopher) and the character is based on Richard Hunt, who was Scooter's original operator. Sadly, Richard died in 1992.